New energy vehicle refers to the vehicle that USES unconventional vehicle fuel as power source (or USES conventional vehicle fuel and USES new vehicle power device), integrates advanced technology of vehicle power control and drive, and forms advanced technical principle, with new technology and new structure.New energy vehicle training platform is divided into pure electric New energy vehicle training platform and hybrid New energy vehicle training platform. 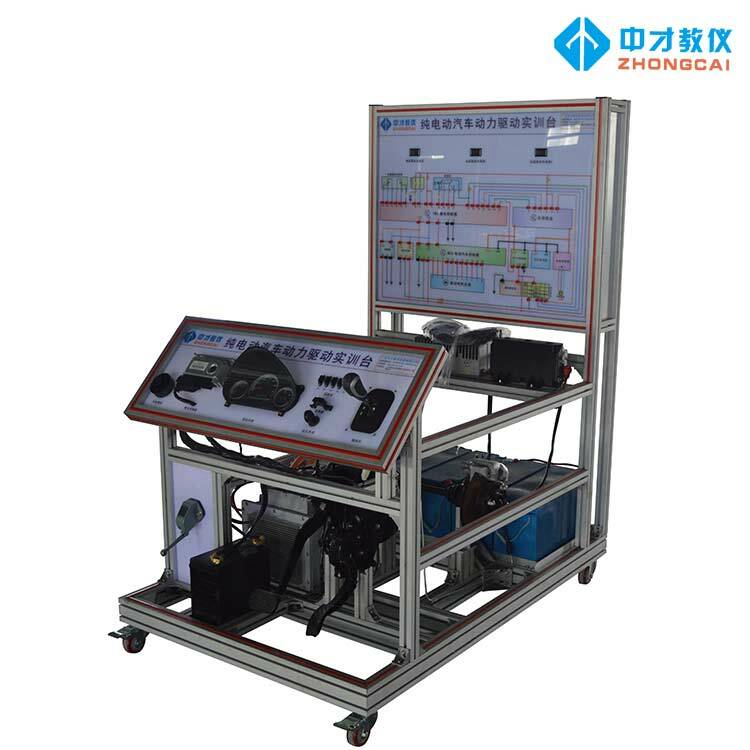 The equipment of New energy vehicle training platform is based on the physical parts of the vehicle, fully demonstrating the construction and principle of the New energy vehicle training platform, so as to help students understand the vehicle New energy system more intuitively and deeply.The main components are installed on the training platform, and the electrical connection of the original vehicle is retained. It is convenient to disassemble and assemble after power failure. The wiring harness and electrical appliances are trained and disassembled, and the key points of high voltage system parts disassembly and safety protection are mastered. The teaching board fully displays the working principle diagram of the electric drive system, installs the detection terminal, and can directly detect the electrical signals of the system circuit elements on the panel, such as resistance, voltage, current, frequency, waveform signals, etc.The panel is made of advanced aluminum plastic, which is resistant to damage, pollution, fire and moisture.Panel printed with never fading color circuit diagram;The output end of the drive shaft is equipped with the original vehicle brake to simulate the vehicle load system. By adjusting the load size at both ends, the change rules of current and voltage and other data of the electric drive system under different working conditions (start-up, acceleration, uniform speed, deceleration, stopping, climbing, etc.) are truly displayed.Equipped with intelligent fault setting and assessment system, the fault point is mainly set in the low-voltage control line to ensure the safety of the high-voltage system and train the real vehicle fault handling ability.For the sake of teaching safety, the platform is equipped with insulated floor (insulated and pressure-resistant glue).